Organiclea are looking forward to the third year of our Buddy Scheme and looking for volunteer buddies to join us. The buddy scheme is a 3 month training programme that trains volunteers to support others to participate in volunteering at Hawkwood Community Plant Nursery. This year buddies will be offered the opportunity to gain an AQA accreditation in supporting volunteers as well as getting practical experience supporting others. 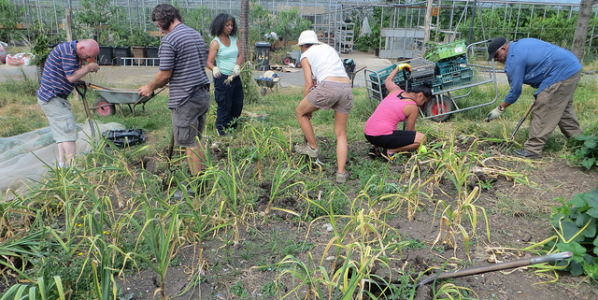 Organiclea is growing people as well as plants and we are able to welcome a diversity of volunteers because of the support given by volunteer buddies. We support volunteers with learning and physical difficulties, language barriers and ill mental health. We value our diverse community, and recognise that volunteering here can bring enormous benefits. The buddy scheme will take place on Wednesdays 9.30am-5pm (lunch provided). In order to achieve accreditation buddies are expected to attend 10 out of the 12 weeks training. Contact Jo Clarke, jo@organiclea.org.uk or 020 8524 4994. We’re always welcoming new volunteers and spring is a fantastic time to come and see us. We will be inducting new volunteers at the Hawkwood site on: Wednesday 6th May, Friday 15th May, Wednesday 3rd June and Friday 19th June. All inductions start at 11am.